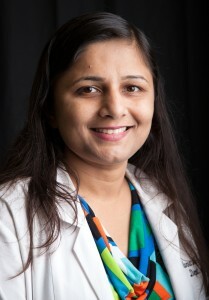 Home Team Faculty & Staff Aparna Wagle Shukla, MBBS, DNB, M.D. Dr. Wagle Shukla is an Assistant Professor in the Department of Neurology at University of Florida. She has an extensive clinical experience which began with three year training in Internal Medicine followed by three years of Neurology training in India. Subsequently she completed her second Neurology Residency from Little Rock, Arkansas. She did her movement disorders fellowship with a special training in clinical electrophysiology from University of Toronto, Canada, a world renowned center for movement disorders. Dr Wagle Shukla’s goal of practice is to provide the highest level of quality care to patients with Parkinson’s disease, dystonia, tremors, chorea and many other movement disorders. She is experienced and proficient in administration of botulinum toxin for dystonia, sialorrhea, migraines and spasticity. University of Florida is world renowned for deep brain stimulation (DBS) surgery. DBS is a highly effective treatment for patients with Parkinson’s disease, essential tremor, dystonia, Tourette syndrome and Obsessive Compulsive Disorder. She plays an active role in the DBS program at University of Florida. She provides expertise for microelectrode recording during DBS surgeries for an accurate placement of electrode in the brain. She also provides outpatient care for these patients through DBS programming. Another area of expertise for Dr Wagle Shukla is clinical electrophysiology of tremors, dystonia, myoclonus and psychogenic movement disorders. In addition she is committed to pursue research in movement disorders. She is the director for Transcranial Magnetic Stimulation (TMS) Laboratory and the co-director for clinical trials in essential tremor, dystonia, Parkinson’s disease, Huntington’s disease and Tourette syndrome to develop better treatments for these conditions. Currently she is working on projects to elucidate the mechanisms underlying DBS surgery in DYT1 dystonia and understand the pathophysiology of cervical dystonia. She is working on several novel treatments involving the use of repetitive TMS for disabling conditions such as orthostatic tremor and cervical dystonia. She has been awarded numerous grants for this research through the Dystonia Coalition, Dystonia Medical Research Foundation, CTSI at UF (National Institute of Health sponsored KL2 grant), Brain and Spinal Cord Injury Research Trust Fund, Blepharospasm Research Foundation, National Organization for Rare Disorders and the National Institute of Health. She has made several international presentations on her research and has publications in many prestigious peer reviewed journals.